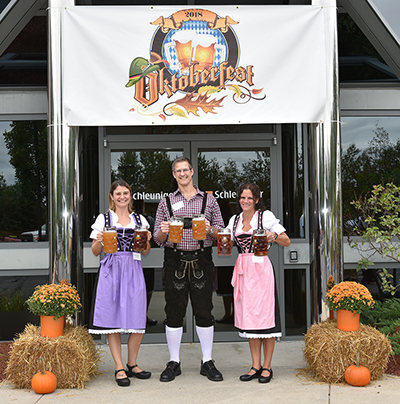 Schleuniger employees dressed in Oktoberfest themed attire and handed out beer steins to visitors at its recent open house in Manchester. Schleuniger, Inc., a Manchester-based international manufacturer of high-precision wire processing machines, hosted an Oktoberfest-themed open house at its headquarters. The event also included presentations by Gem Gravure, Panduit and Telsonic Ultrasonics also exhibited at the event. Open Access Technologies, Inc., a Nashua-based software developer that provides accessibility to data, visualizations, deep graphics and content, has named Ken Breen as its president. Breen brings over two decades of operational leadership in product and process innovation in the publishing industry. Reporting directly to Howard Berke, the company’s co-founder, chairman and CEO, Breen is charged with running day to day operations and scaling the company. AeVitas Technology Consulting, LLC, a Derry-based IT support services provider, recently announced the release of Data Horizon, a new product line that will revolutionize the data protection and business continuity market space, says business owner Johnathan A. Z. West. The Data Horizon Platform is a software, hardware and virtualization solution that will protect a business against a litany of disaster scenarios such as flood, fire, service outages, hardware failure, viruses, ransomware, security failure, employee mistakes and fraud. With every business-critical system monitored and maintained by a vast network of security experts, as well as all business data and applications backed up locally and, in the cloud, utilizing 9 data centers on 6 continents, a Data Horizon Engineer, to return business systems to a functional state in 6 seconds, says the company. More than 20 FIRST Robotics Competition teams from high schools across New Hampshire will participate in the inaugural ‘Governor’s Cup,’ an off-season robotics competition taking place on Saturday, Oct. 13 at Plymouth State University. Up to 50 high school seniors will have the opportunity to earn one-semester scholarships to New Hampshire’s public institutions, including the University of New Hampshire (Durham and Manchester), Keene State College, Plymouth State University and New Hampshire’s community colleges. In addition, five seniors will be awarded $2,000 scholarships, underwritten in part by Eversource. Newington-based company Daystar Inc. has become a champion of National Cybersecurity Awareness Month (NCSAM) 2018. The local technology services provider will be joining a growing global effort among businesses, government agencies, colleges and universities, associations, nonprofit organizations and individuals to promote the awareness of online safety and privacy. Pictured here: Chuck Withee, Provident Bank president and chief lending officer; Zenagui Brahim, president NH Manufacturing Extension Partnership; Wildolfo Arvelo, director, NH Department of Business and Economic Affairs; and Leanne Spees, Provident Bank international finance officer. For the second year in a row, The Provident Bank has partnered with the New Hampshire Manufacturing Extension Partnership as the lead sponsor of Manufacturing Month, which kicked off on Oct. 5 at Next Phase Medical Device in Rochester. As part of the NH Manufacturing Month, NH MEP has published the second issue of Cool Stuff Made in New Hampshire magazine geared toward middle and high school students who are exploring manufacturing careers. Robocalls nationwide reached a new record of 4.4 billion robocalls in a single month, in September, the highest since YouMail Robocall Index launched in 2015. That's a 4.4 percent rise over the previous month and 83.9 percent year-over-year increase. Scams and telemarketing calls together now account for roughly 61 percent of all robocalls with 408 million health and health insurance scam calls, 187 million easy money scam calls, 146 million interest rate scam calls and 74 million student loan scam calls. New Hampshire ranked 41st in the country for number of robocalls in September at 10.5 million. Karil Reibold, president of Reibold Consulting and a UNH adjunct professor who teaches private equity, venture capital finance and entrepreneurship, will lead the Oct. 25th Wildcatalyst Seminar at the University of New Hampshire in Durham. Reibold, who has helped companies raise in excess of $300 million in venture capital and worked with venture funds in Silicon Valley and Boston, will provide insight on finding the value and market potential of an idea, and will share her advice for creating a vision, strategy, clear objectives and the right culture for a successful venture. The event will take place at 4:30 p.m. with networking and refreshments to follow. For more information, click here. The registration deadline for New Hampshire’s Second Annual Virtual Coding Competition is Saturday, Oct. 13. The eight-week virtual competition requires students from middle and high school to use CoderZ, a cloud based coding platform to compete in over 80 different and challenging robotics missions. To register, click here. Boston-based Leading Edge Real Estate — which covers Southern New Hampshire, Eastern Massachusetts and Cape Cod — has partnered with real estate technology company Boston-based MoxiWorks to adopt a one-stop shop experience through MoxiWork's platform that fully integrates every piece of the transaction process. Fortune magazine named Abigail Johnson and Kathleen Murphy of Fidelity Investments, Safra Catz of Oracle, Bonnie Hammer of Comcast and Anne Finucane of Merrill Lynch to its 2018 Most Powerful Women list. Great Bay Community College is offering a two-semester program in which students gain high school and college credits, and a manufacturing certificate while working at Safran Aerospace Composites. They are also guaranteed an interview at Safran for full-time positions. The University of New Hampshire School of Law has partnered with global blockchain expert Samson Williams and his consultancy Axes & Eggs to offer the first Blockchain, Cryptocurrency and Law Certificate. The BC&L program, which is open to anyone with a bachelor’s degree starting in 2019, and is especially tailored for law students, practicing lawyers (including in-house counsel), blockchain startup management and “blockchain-adjacent” entrepreneurs and executives who provide services in the industry. It is also relevant for lawmakers and regulators and other professionals interested in securing a solid foundation in the legal implications of this essential, emerging technology, said the college in a press release. Nrby, Nashua-based company that provides location-based technology, recently announced Kansas-based Eagle Communications has joined the growing base of cable providers using the Nrby platform to accelerate and enhance plant operations. Using the Nrby app on their smartphones, Eagle technicians simply drop a SmartPin representing the issue/event at hand on a map and fill in required information, including notes, photos and videos, in the SmartPin’s electronic SmartForm. That real-time data is automatically collected, processed and stored in historical records, while made available via a web-based dashboard.